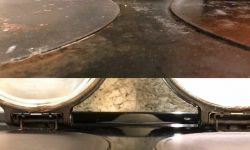 Cleaning your Aga inside & out. 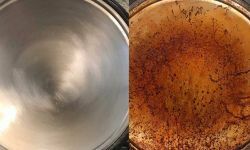 We use a unique cleaning process that removes all the baked on fat and grease that builds up over time, on the various surfaces of the Aga. 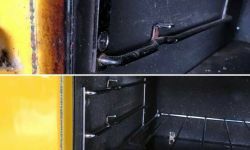 The insides of the ovens receive both the steam clean and a wire brush treatment, to bring it back to its former glory. 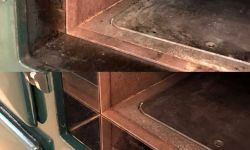 Remove baked on fat and grease from the entire Aga including the inside of the doors, door surrounds and lids. Steam clean, sanitise and wire brush the inside of the ovens. 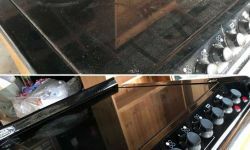 Clean and restore the work surface around the cooking rings on the Aga top. Polish all exterior and chrome surfaces. 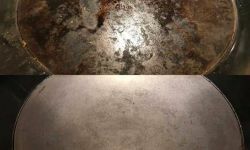 Restore and re-touch chip marks on the enamel surfaces. Re-pack insulation around the cooking rings. Replace lid and door seals. 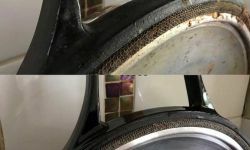 Thank you very much for cleaning my aga today. It looks like a new one. 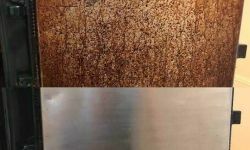 The service you gave was excellent and very professional, I could tell that it was your own business with a true passion for not just doing the job but doing it well. I am delighted to have made yours and Karen's acquaintance today and I shall have no hesitation in recommending you to anyone who has an Aga. I shall defiantly be booking you again next year.